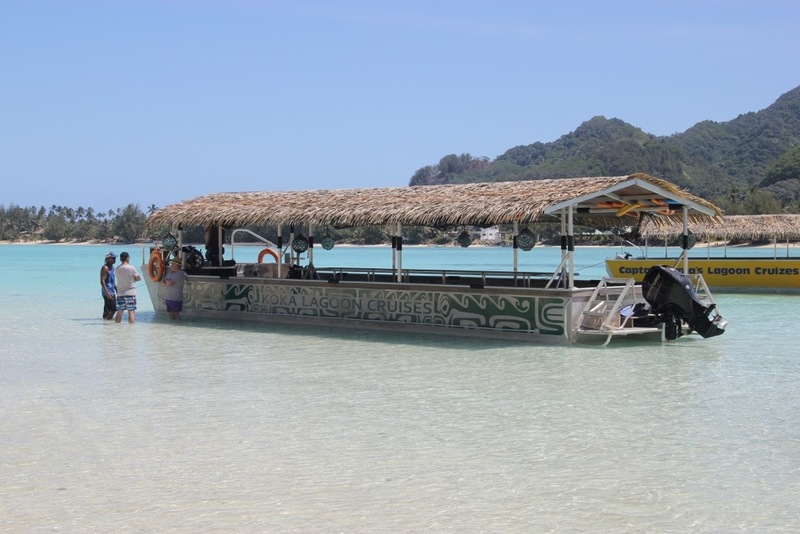 One of the activities we were told is a must when visiting Rarotonga is a cruise on the lagoon at Muri. 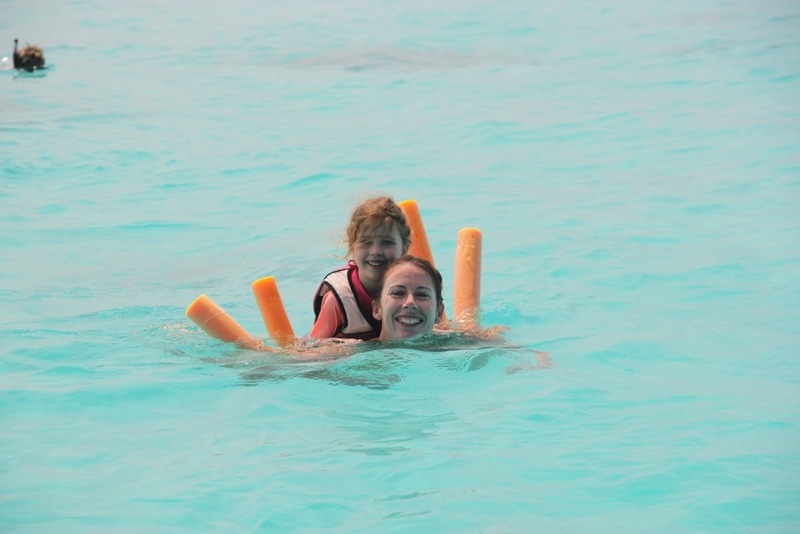 A couple of operators run daily glass bottomed boat adventures, which include snorkelling, musical entertainment, a barbeque lunch, and a “coconut” show, including palm tree climbing and coconut husking. 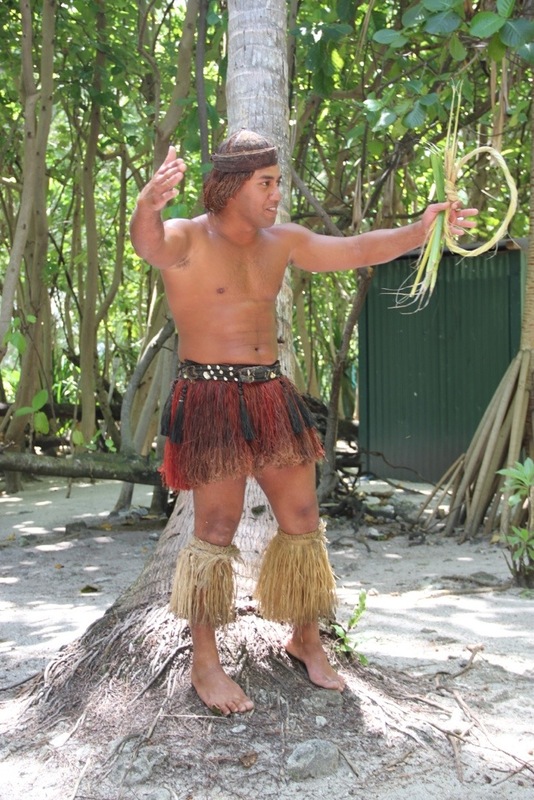 It all sounded very package touristy, but… when in Raro! 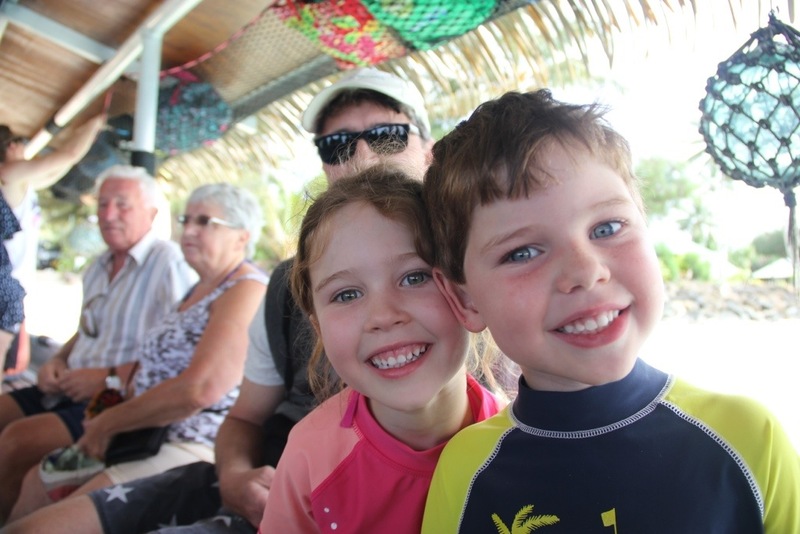 We weren’t sure we’d get on a boat at all, given Miss Phoebe’s fear of watercraft, as you can read about in our adventures in Sarawak in Borneo and Montague Island near Narooma. 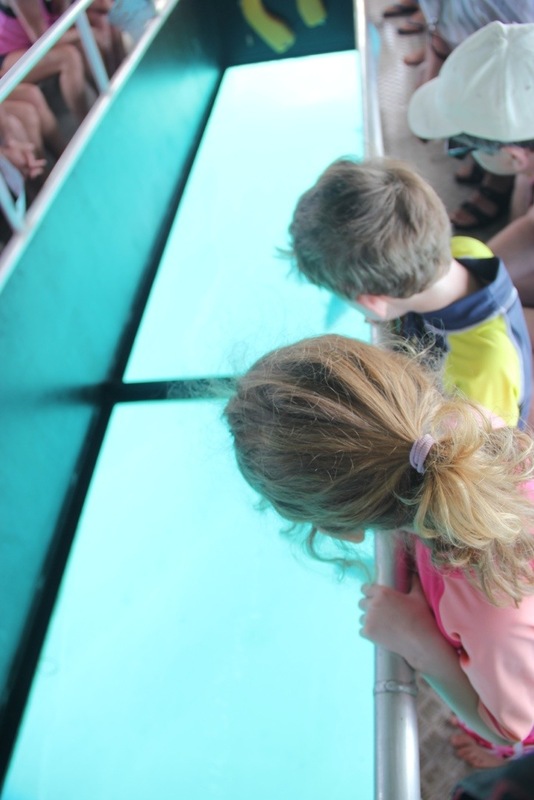 When I asked her whether she would consider taking a trip in a glass bottomed boat, after answering all of her questions about the structural functionality of a glass bottomed boat (such as where the glass is, actually) the answer was a surprisingly confident, ‘yes’. 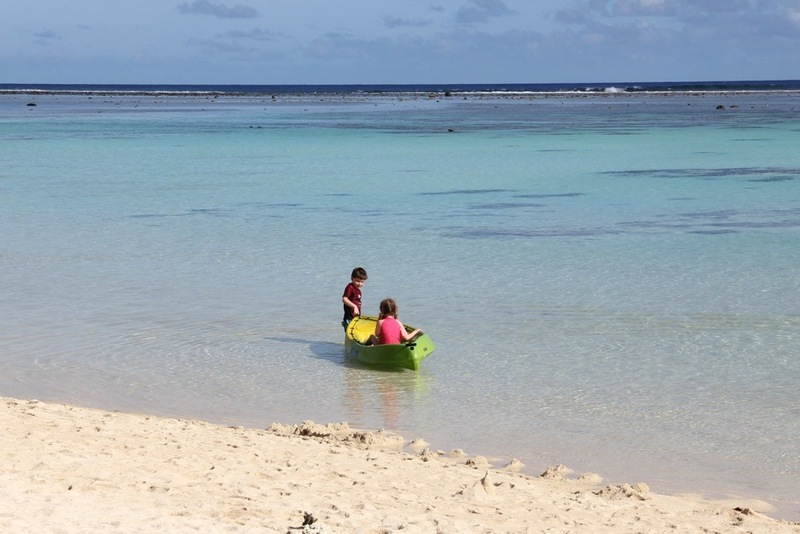 It seems that a few days mucking about with a kayak in the aqua marine waters of Raro cured her of her boat phobia. That, and the prospect of an aquarium right underneath the boat was too exciting to resist. 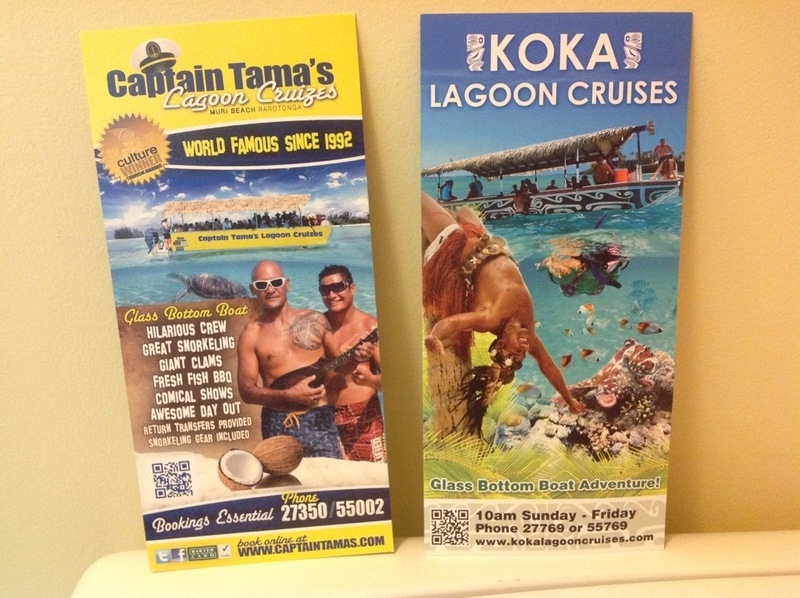 As far as we could tell by the brochures, Captain Tama’s Lagoon Cruizes (with a ‘z’ for extra zest) and Koka Lagoon Cruises both run a similar kind of operation. Although I’d like to say we chose Koka for their superior spelling, I didn’t notice that until later. We gave Phoebe the choice for being brave, and she selected the Koka brochure for its pictures. The Koka website says that the trip costs NZ$79 per adult, and NZ$40 per child aged 5+, but they didn’t charge us for our two five-year-olds, which was pretty cool. We were told under sixes are free. 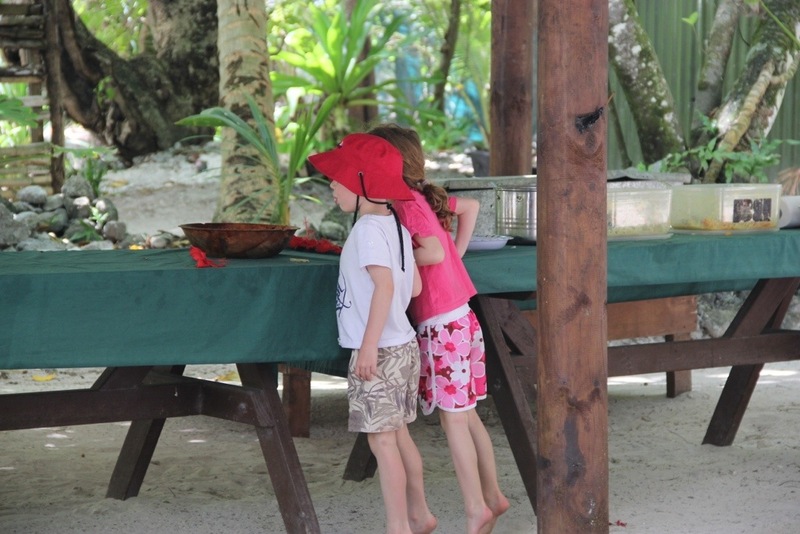 They also do family deals, starting at $210 for two adults and two kids. While it seems pricey for a 3.5 hour tour, in my opinion the cost is worth it. 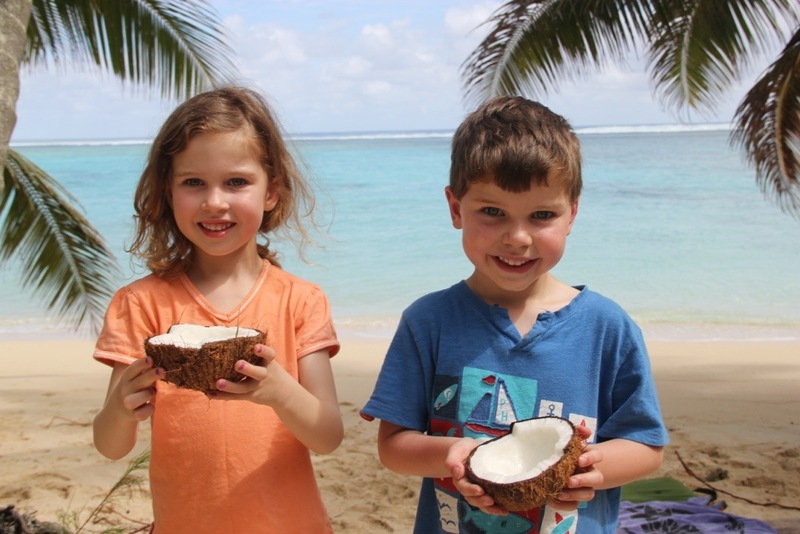 This is probably one of the most fun touristy days out that we’ve had – and it’s definitely our Raro fave. The trip began at 10am in Muri, and we were all smiles as we boarded. 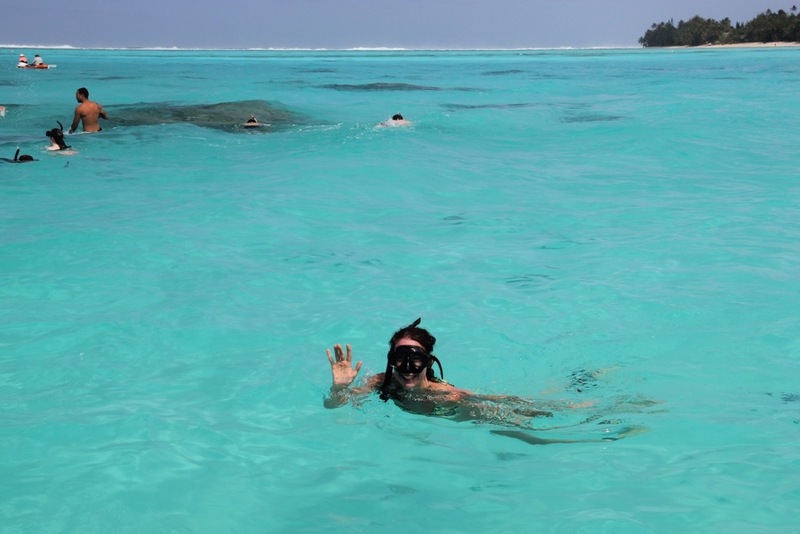 It’s important to mention that you don’t do this trip for the snorkelling. 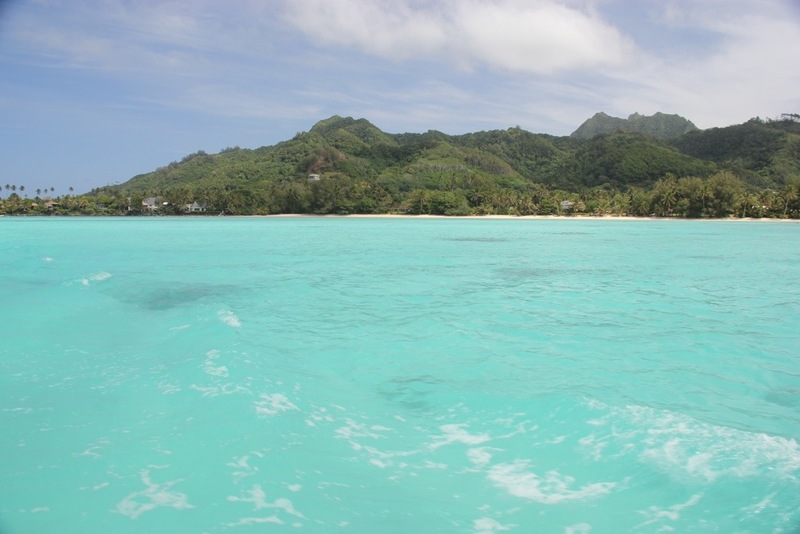 If you want good snorkelling on Raro, head down to Titikaveka opposite Fruits of Rarotonga in the south-east, or Aroa Beach in the south-west, and swim into the reef from the beach. 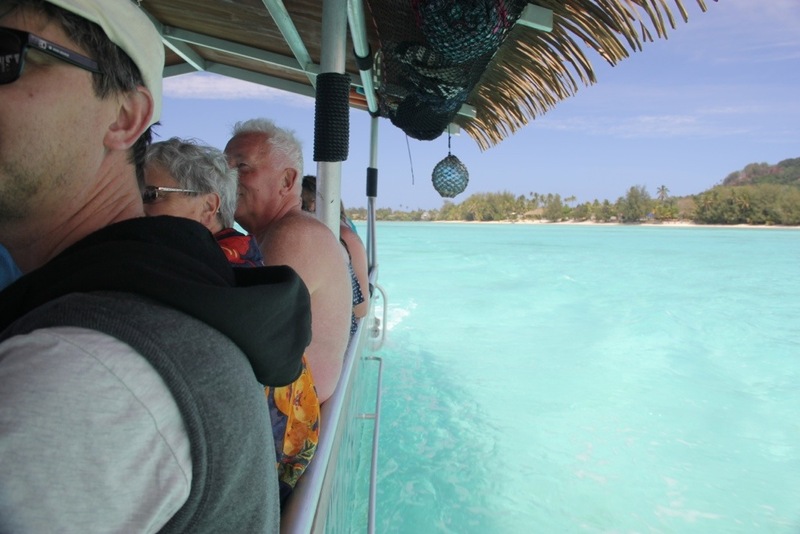 While the snorkelling spot on the lagoon cruise is one of Rarotonga’s marine conservation areas, and there are lots of fish about (they like the visiting boats as they get a feed each day), there’s nothing spectacular reef-wise to be seen in the water. There are small areas regenerating coral and farming clams, but that’s about it. 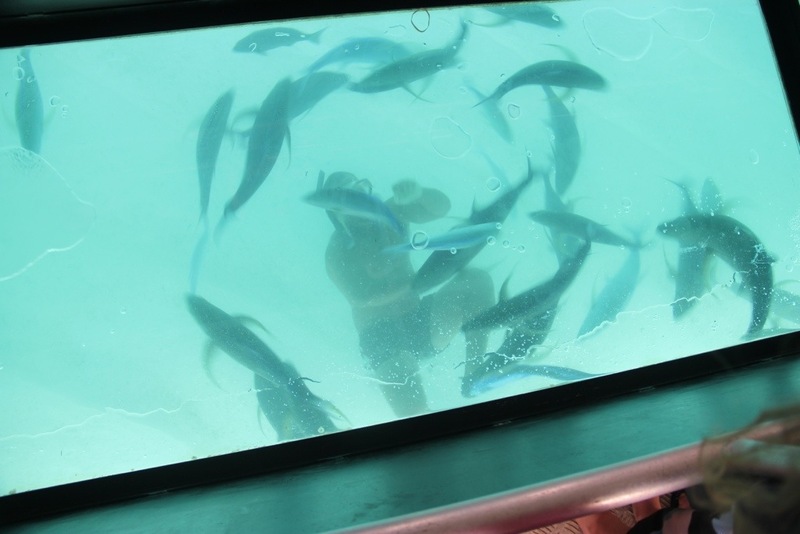 That said, one of the kids’ favourite part of the cruise was seeing the fish through the glass windowed hull. The crew got in the water and fed the fish from underneath the boat, so we spotted a school of blue finned trevally and some other pretty sizeable inshore reef dwellers. I’m not quite sure about the environmental responsibility of fish feeding, but it was certainly a spectacle that the crowd enjoyed. The owners donate a portion of each ticket to marine conservation, so I’ll let the fish feeding slide. 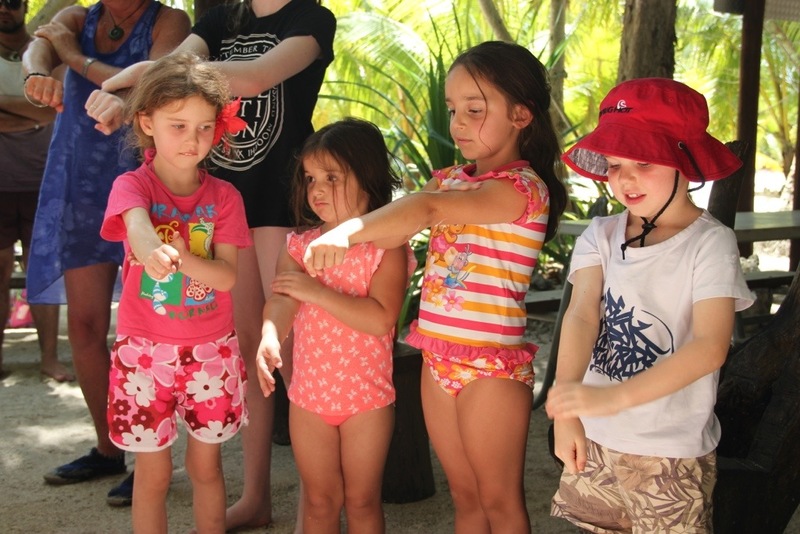 We got in the water afterwards and had a swim around – it was exciting for the kids to be swimming with fish. And just check out the colour of that water. It’s spectacular! 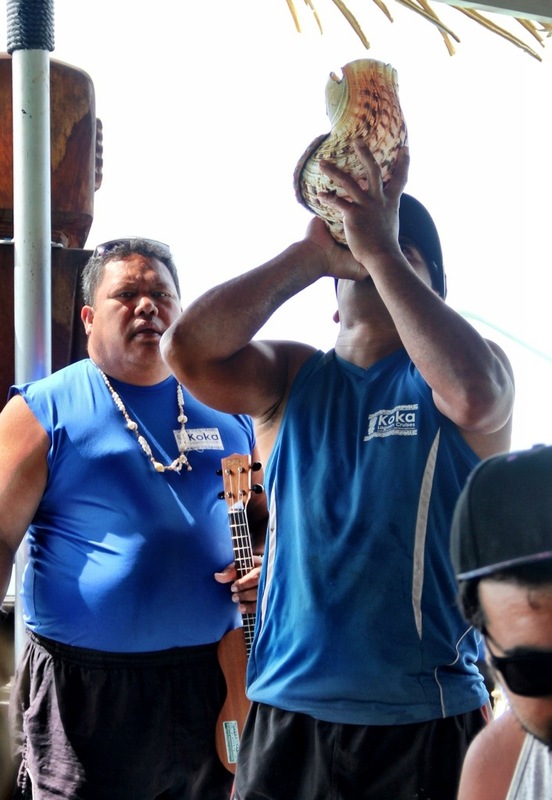 But the real reason to do a lagoon cruise with Koka is for the entertainment. When the Koka team advertise that they have a ‘talented’ crew, they are not exaggerating. 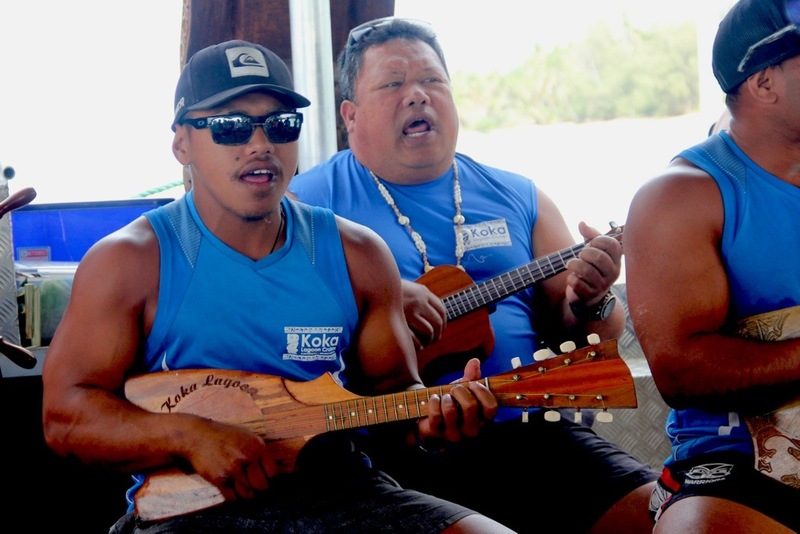 Local boys Captains Amazing, Jack Black Sparrow, Cook, and Awesome got the party started as the boat left the beach at Muri, with a massive Cook Islands greeting, “Kia Orana” (may you live long), then kicked in with some local tunes on the ukulele and drums. They cracked jokes along the way, and their humour and charisma more than made up for the mediocre snorkelling. Following the swim and snorkel, we headed to Motu Koromiri, the little island directly across the lagoon from Muri Beach. The cruise wasn’t long, but the lagoon is beautiful. While the aptly and humorously named Captain Cook got to work on the tuna BBQ spread. 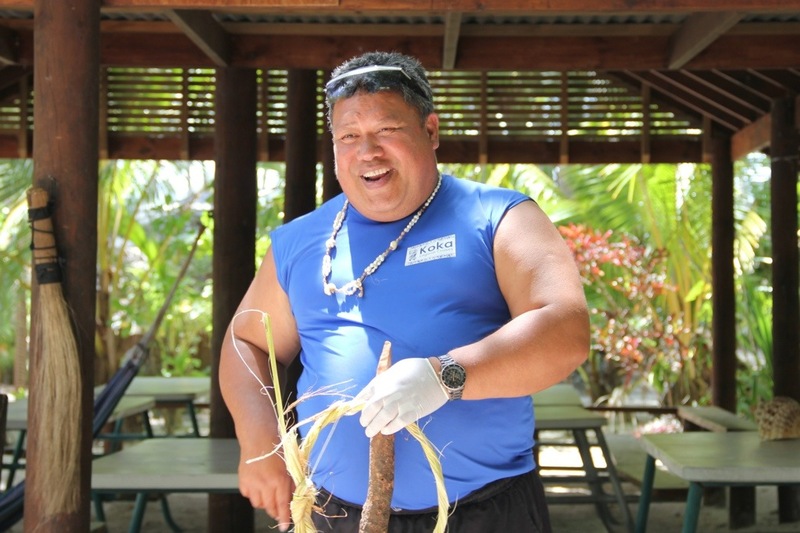 But when all is said and done, Captain Awesome (also aptly-named, and hailing from the tiny remote Cook island of Pukapuka) is really the star of the trip. On the boat as we cruised, he demonstrated a variety of parau ties (parau is the local word for a sarong), made hats and glasses by weaving palm fronds, and was a master of the conch, summoning us back after our swim with a call from the shell. Off the boat, after lunch, Captain A showed us his champion palm tree climbing skills. He did a slow demo first, then went to the top and back in eight seconds. Crazy skilful! 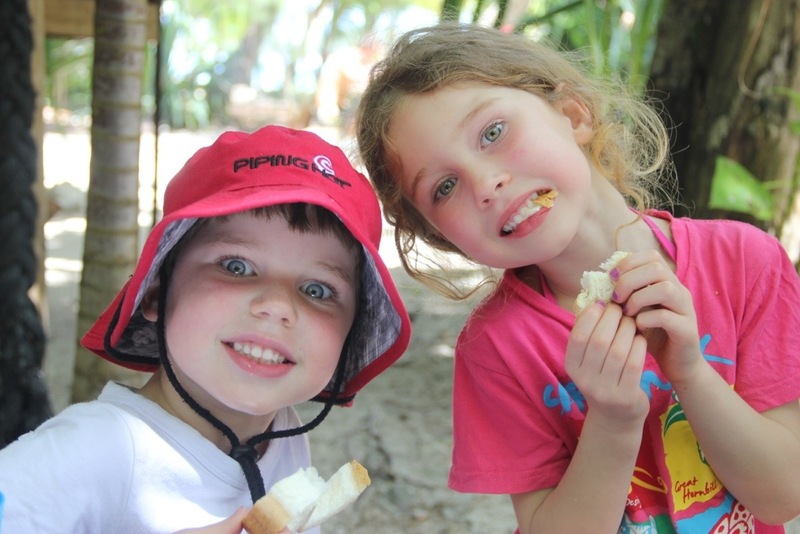 When Captain A is telling the story, coconuts become that little bit more interesting. 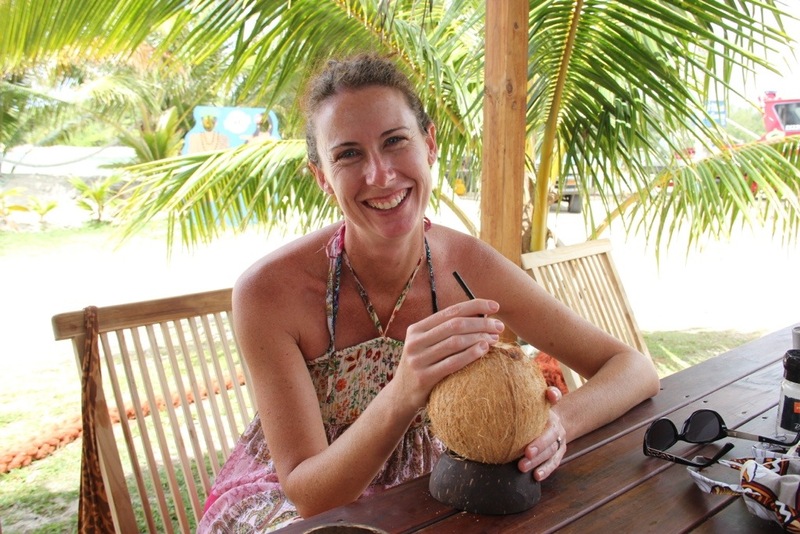 If you’re heading to Rarotonga, remember that a “nu” is a drinking coconut, and you will experience the sweetest coconuts you have ever tasted. Here’s me enjoying a lovely nu. 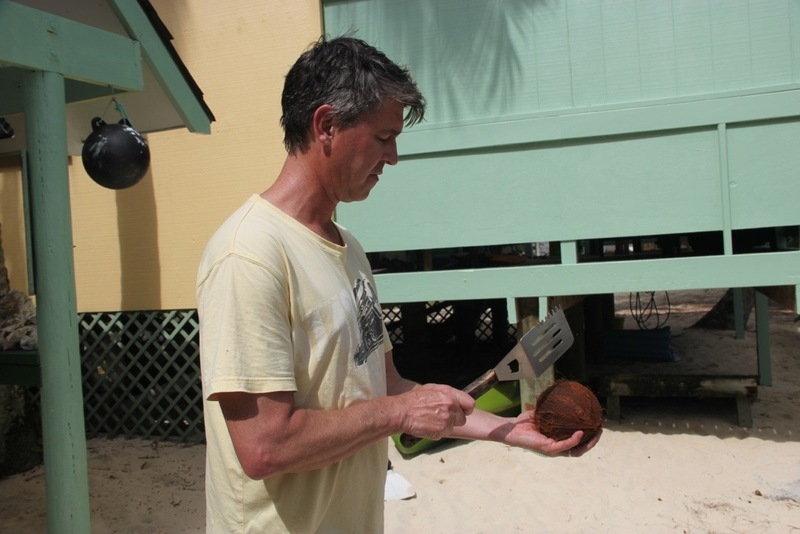 As an aside, Steve had a go at cracking a coconut back at our place, with great success. My very own Captain Awesome! 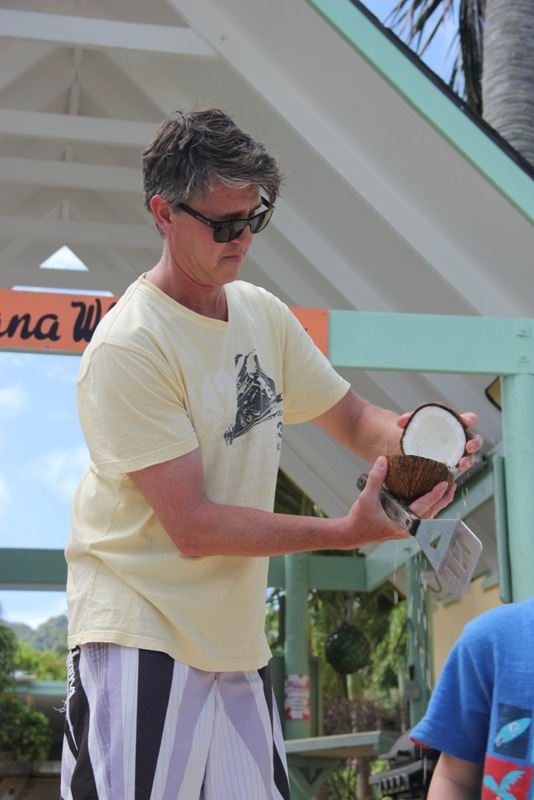 Who knew an egg flip could crack a coconut? 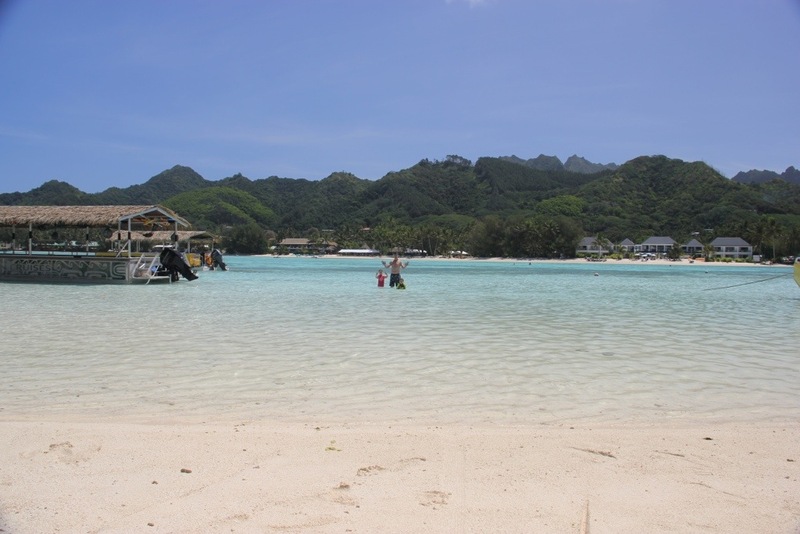 Would I recommend visitors to Raro take a lagoon tour? Yes! It’s great for all ages. Go with Koka and you’re assured of a great day out. The Captain Tama’s crowd didn’t look like they were having half as much fun. How professional. Enjoyed your blog. 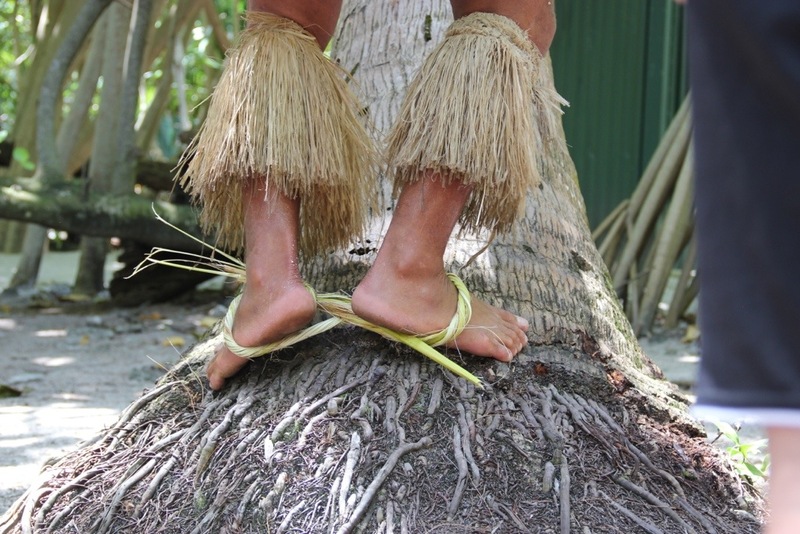 Just returned from Raro for the 2nd time. Had to go on Koka Lagoon cruise again to check we weren’t dreaming. It was just as enjoyable the second time. 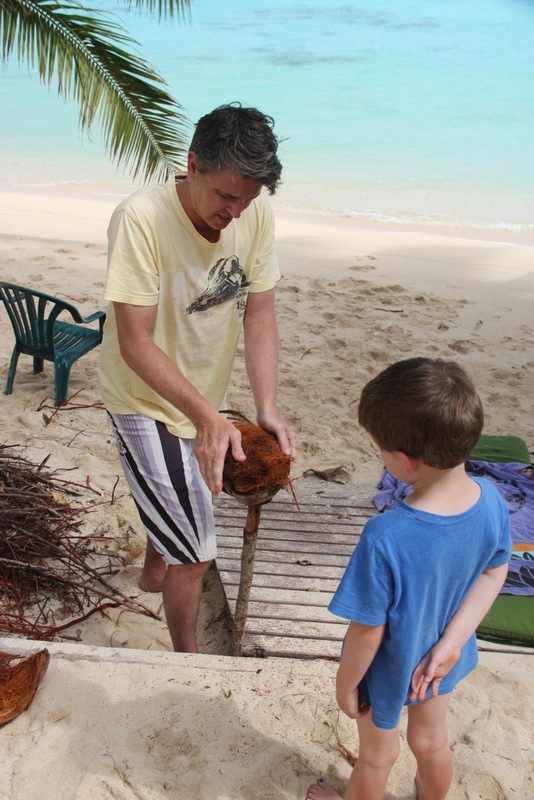 Problem is we can’t remember the stages of coconut maturity. Nu is first stage. Second stage is something like Akari?? Do you know what the third stage is? That is the stage where roots and stem begin to grow.